SDSU edges USD in OT Sunday. BROOKINGS, S.D. 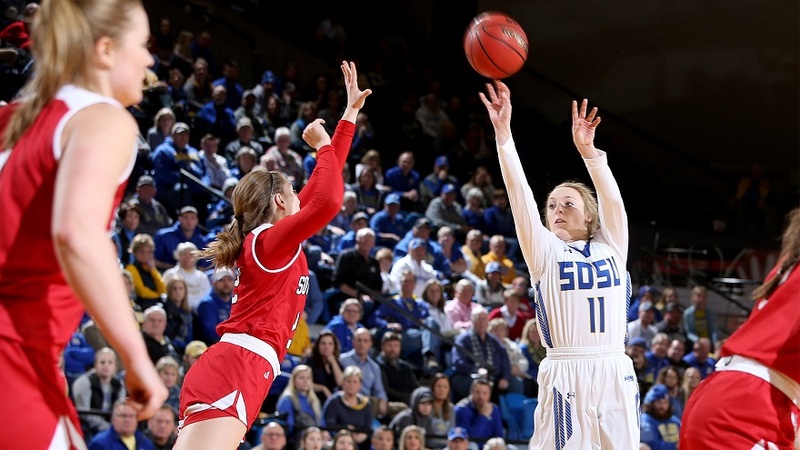 — Macy Miller scored 28 points and Tagyn Larson had 21 points and 11 rebounds to lead South Dakota State over No. 23 South Dakota 82-78 in overtime on Sunday and take command of the Summit League race. The Jackrabbits (22-6, 14-1) have one league game remaining at home against Western Illinois. The Coyotes (24-4, 12-2) have home games left against North Dakota State and North Dakota. The teams split their season series with the Coyotes winning 105-98 in double overtime on Jan. 6. SDSU extended its win streak to 12 while ending South Dakota's at 11. A Miller 3-pointer — the game's final field goal — gave South Dakota State the lead for good with 1:02 left in overtime. Five free throws in the final 38 seconds kept the Coyotes at bay. South Dakota held a lead from late in the first period until early in the fourth when the Jackrabbits got consecutive 3-pointers from Madison Guebert followed by another from Cascio Jensen to start a 13-2 run for a four-point lead. South Dakota rallied to tie at 69-all with 1:45 remaining in regulation and that was the score heading into overtime. Guebert finished with four 3-pointers and 18 points. SDSU made 23 of 32 free throws to 10 of 14 for South Dakota. Ciara Duffy scored 23 points and Chloe Lamb 19 to lead the Coyotes.